After receiving my "Death Has Keen Eyesight" T-shirt the other day, I was severely tempted by this latest offering from shirt.woot [^]. 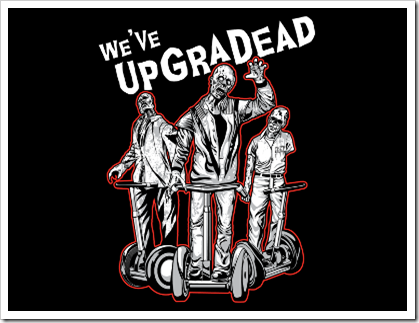 One t-shirt combining tech-humour and zombies – what more can anyone ask for? There is no mention of how many Vista upgraders were used in the production of this work. Posted in: General Links, Links, Strange Creatures.